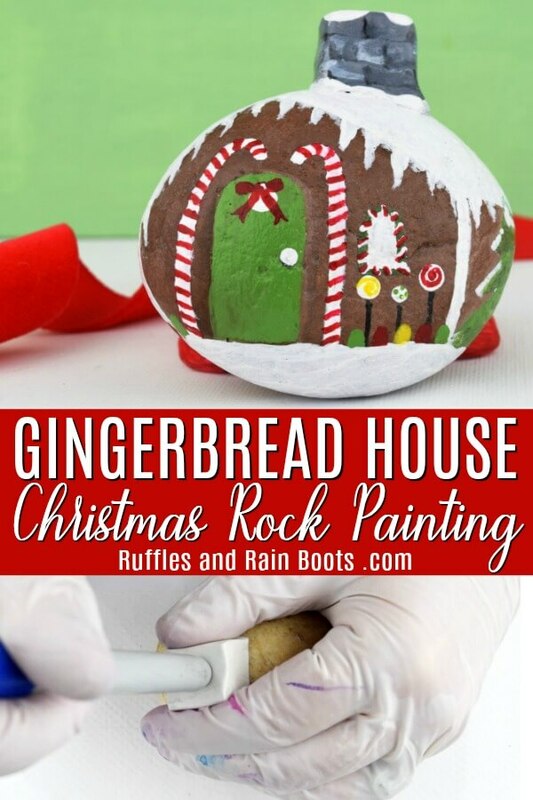 This gingerbread house rock painting idea takes painted stones and rock art to a new level! Join us for some Christmas rock painting fun. Easy Christmas Story Stones (Perfect for Kids)! 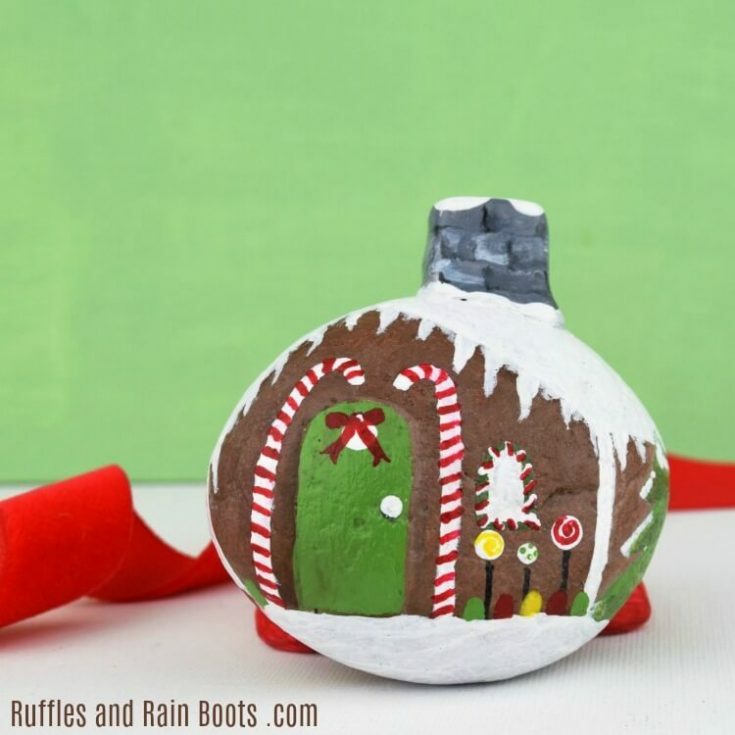 You can see that here on Ruffles and Rain Boots, we are no stranger to fun holiday rock painting fun. 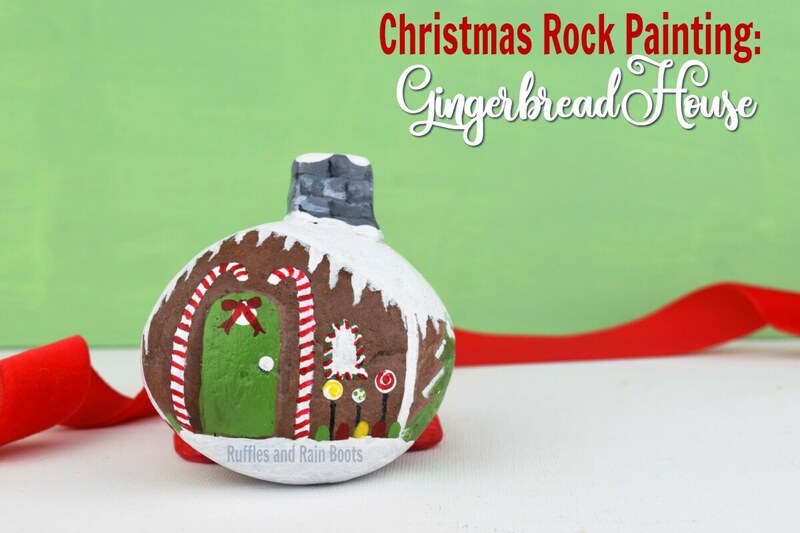 To continue with another fun Christmas rock painting idea, I’ve made this adorable gingerbread house rock painting. If you’re a crafter or a rock painter, you likely have all of these items on hand. Be sure to check out my Amazon Rock Painting Shop for my favorite rock painting supplies. Note: you could wait for a rock with a perfectly shaped chimney or even just paint one on, however, we made our own with polymer clay. It’s ridiculously easy to make this rock even though it’s gotten more “oohs and ahhs” than I can count. Break off and knead a small piece of polymer clay for a chimney. Mold it to the to top of the rock in the place it will be mounted. Using your finger (or a marker tip), create an indention in the chimney. Remove the chimney from your rock and bake it per the clay’s instructions. Once cooled, affix the chimney to the rock with e6000 glue. Paint the bottom portion a brown color and while it’s drying, paint a stone pattern on the chimney. Accent it and the top of the gingerbread house rock painting with snow. Icicles optional, but I think they’re cute. Check out how easy this gingerbread house rock painting is to make. It was a perfect holiday craft to do with my daughter. These are not rocks to paint and hide, friends. I know you likely are aware that anything with additions shouldn’t be left out in nature. Our gem rock painting idea is a great rock painting idea for kids, but we made it clear that they shouldn’t be left outside. 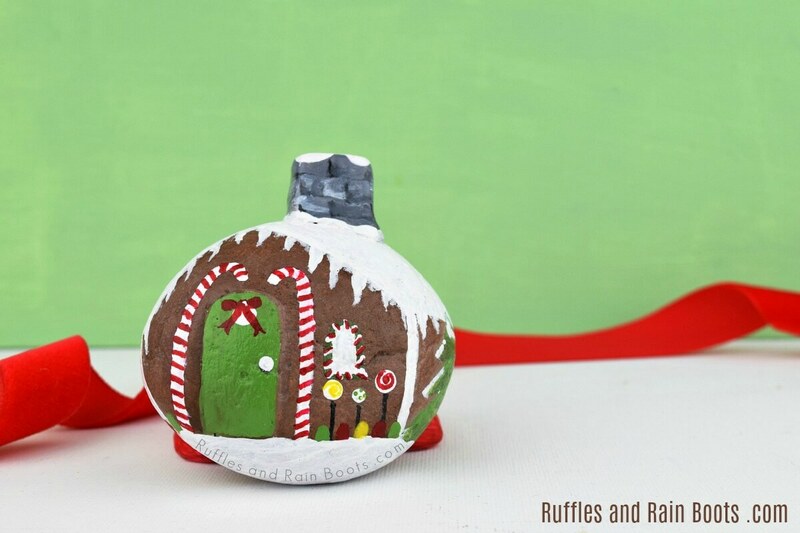 We love rock painting here at Ruffles and Rain Boots and would love it if you subscribed to get updates when we share new rocks.